A new batch of startups cities is cropping up, drawing more investors to new companies like Cincinnati's Lisnr, a mobile app designer. Thinking about launching a startup? Then forget Silicon Valley, and try Boulder or Nashville instead. Maybe even Cincinnati. Each took steps to create a startup-friendly environment, and efforts are paying off. In Cincinnati, local giants Procter & Gamble and grocery chain Kroger have stepped in. P&G put executive Jeff Weedman in charge of Cintrifuse, a nonprofit that offers startups office space and networking. It also invests in venture capital funds as a way to attract investors to the city. 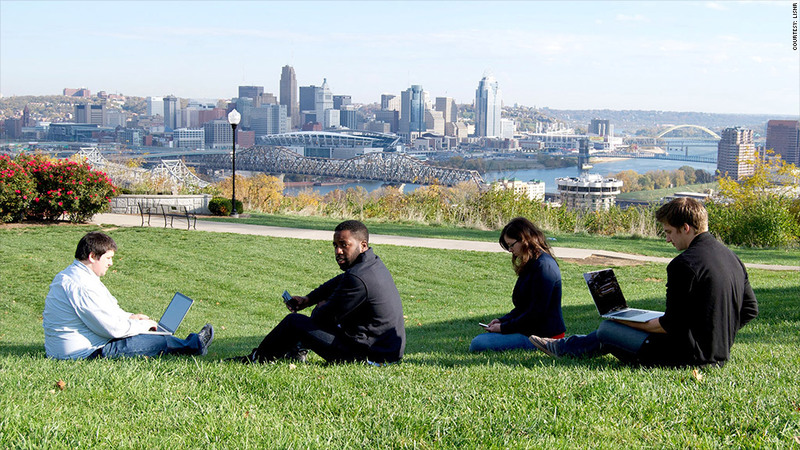 Startups can also get funding from nonprofit venture capital firm CincyTech and mentoring support from The Brandery. "We don't need to compete with Silicon Valley, Austin or Boston," Weedman said. "We're trying to build out this ecosystem so that 10 years from now, if our kids want to build a startup, they don't have to move away." They're sticking around. Most of The Brandery's 25 graduates were from outside Cincinnati, but 15 stayed. The resources are pivotal for startups like Lisnr, which uses Cintrifuse's office space. Lisnr designed a mobile app that listens for inaudible signals in songs and presents users with extra content, like artist information or merchandise deals. "There isn't a startup in this world that wouldn't want to walk down the hall and talk to the world's largest advertiser, P&G, on a daily basis," said CEO Rodney Williams. Further south is Nashville, whose strength lies in its mentor network. Self-made millionaires like Lucius E. Burch III have always been around, but it wasn't until the city's chamber of commerce propped up the Entrepreneur Center in 2010 that it wrangled them all together. The center offers startups coursework, guidance and a shot at raising funds -- and serves as a meeting space for tech entrepreneur group GrowNashville. Nashville has steadily climbed up the ranks of venture capital investment, reaching a top 20 spot in PricewaterhouseCoopers' MoneyTree report. The city's investors have put $72 million in 21 companies so far this year, compared to $38 million in 8 companies in 2009. "You'd be surprised how much money startups raise," said Joe Maxwell, a venture capitalist. Maxwell rose as Nashville's success story in the 1990s when his firm, Investment Scorecard, became a blockbuster analytical services provider to Wall Street. He sold it for upwards of $50 million in 2007 and funneled some of that back home. When he meets with an aspiring entrepreneur every week, his low key blue jeans style disguises deep pockets. He always offers advice, funds nearly one in five and refers many along to wealthy contacts. One of those is Jerry Bostelman, CEO of Vaco, a staffing company for freelance administrative professionals. Bostelman said outsiders eventually discover the benefits of Nashville. "You come here kicking and screaming, then you realize your house is 30% larger, the commute is cut in half and relationships matter in the business community," Bostelman said. Meanwhile, Boulder remains the nationwide model for startup hotbeds. It's home to TechStars, the nation's best-rated mentoring and networking program. Since 2007, its Boulder program has helped 65 companies launch and raise $115 million. Most are still active or have been acquired, and TechStars estimates 75% stayed in town. Boulder's venture capital activity -- $227 million invested in 31 companies so far this year -- also ranks consistently among the top cities in PwC's MoneyTree report. Lower wages and the University of Colorado's research facilities help. But TechStars graduates say the communal atmosphere matters most. Yoav Lurie learned that when presenting his company idea at the university last year. He described Simple Energy's plan to create online games that convince everyday people to use less electric power. Utility companies would pay him, because they get closer to meeting regulatory benchmarks when customers use less energy. Then a cognitive science Ph.D. student in the crowd fired a question. "I like this approach," Jason Zietz said. "But there's nothing here talking about changing people's behavior in the long term." Although Lurie initially took the comment as hostile, he soon learned that Zietz, like many in Boulder, felt deeply invested in Simple Energy's success. Better startups mean a better Boulder. Zietz has since peppered him with lengthy, analytical emails and pressing questions -- essentially free work. "Sure, it's competitive. But it's not cutthroat," Zietz said. "There's a genuine desire to see everyone succeed."